Tulsa’s 2016-17 points leader re-signs with Oilers after starting the season overseas. 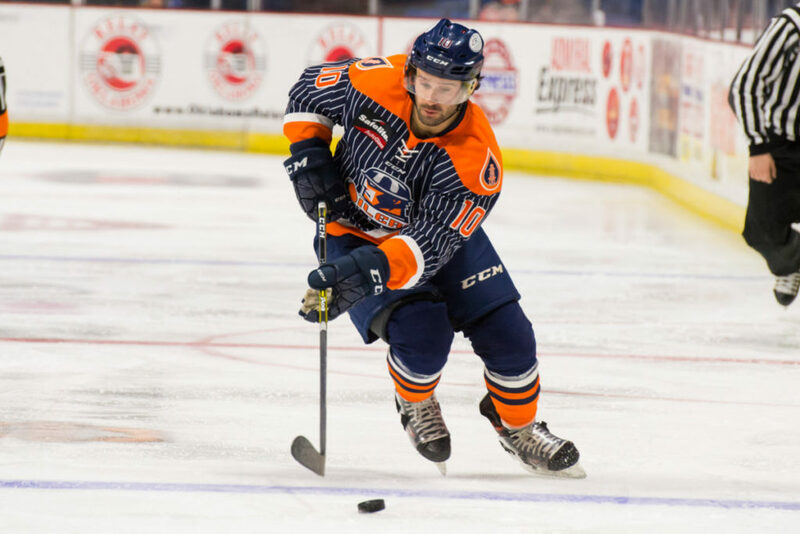 TULSA, OK – The Tulsa Oilers, proud ECHL affiliate of the National Hockey League’s St. Louis Blues, and Head Coach Rob Murray announced Monday that the Oilers have re-signed forward Garrett Ladd, who led the 2016-17 team with 34 points (17g, 17a). Ladd, 28, returns to Tulsa, where he had a breakout season for the Oilers in 2016-17. The Fenton, MI native’s 34 points in 58 games were best on the team last year. His 17 goals were second on the Oilers’ roster. Ladd started the season in the Elite Ice Hockey League (EIHL), where he compiled 6 points (3g, 3a) in 8 games for the Coventry Blaze. The third-year pro had also split time with the ECHL’s Stockton/Adirondack Thunder, Elmira Jackals and Missouri Mavericks, before signing in Tulsa last season. Ladd played one season of college hockey at Bemidji State University in Bemidji, MN, before finishing at the University of Wisconsin-Stevens Point, where he totaled 89 points (35g, 54a) in 82 games from 2012-2015. Ladd will join the Oilers on their final two road games of a 14-game stretch, as Tulsa heads to Toledo next for a 6:15pm CT tilt against the Walleye Friday night at the Huntington Center. Catch all the action on the Sports Animal (99.9FM/1550AM) in Tulsa, ECHL.TV, or www.tulsaoilers.com (Listen Live), with coverage starting at 5:55pm CT.